Plano 4-Tier Heavy-Duty Plastic Shelves Just $14.97! Down From $34.32! You are here: Home / Great Deals / Plano 4-Tier Heavy-Duty Plastic Shelves Just $14.97! Down From $34.32! 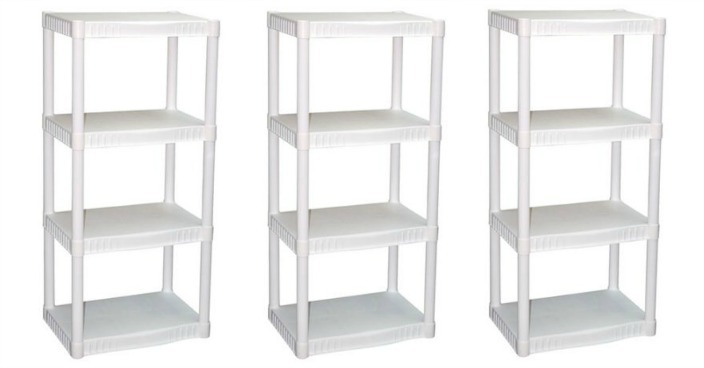 Right now you can get this Plano 4-Tier Heavy-Duty Plastic Shelves for just $14.97 (Reg. $34.32) at Walmart! Store your favorite knick-knacks and other personal items with the Plano 4-Tier Heavy-Duty White Plastic Shelves. This unit is made of durable, impact- and rust-resistant plastic that can be used to store just about anything. You can use it to hold your kid’s art supplies or your gardening tools. You can also use it to place your grill outdoors. Assembling these Plano plastic shelves takes only a few minutes with no tools required. Once assembled, the unit gives you a great way to de-clutter your basement, attic, closet or garage. Available in neutral white, these 4-tier shelves blend in well with most decors. The unit’s compact design lends itself well to easy corner installations. This lightweight module can be moved easily from one place to another, depending on where you wish to put the shelves. You can also modularize the shelving on this unit to fit your storage needs.